The Wauseon High School Speech and Debate team includes - front, from left - Maggie Carder, Kamron Goolsby, Olivia Gigax, Faith Stinner, Emily Hoeffel, Quintin Gigax, Anias Thompson - back, from left - Reece Mealer, Chase Mattin, Alex Guerrero, Noah Harman, Hunter Mattin, Jeb Reeves, Christian Cantu. Dolores Muller thinks people who believe the art of speech and debate is a dull and drowsy affair ought to take a second look. As head coach of the Wauseon High School Speech & Debate team, she watched the 22 members excel this school year, with victories among nearly 1,216 hopefuls in the state competition and an invitation to the national contest this June. Their winning material came from classic and contemporary authors and playwrights, their performances from weeks of honing their skills. Members Alex Guerrero, Noah Harman, and Christian Cantu advanced to this year’s quarterfinals, and Noah and Christian to state finals, at competitions held at Jackson Local Schools near Canton. Noah, a sophomore, placed second overall in state and as first runner-up to attend nationals among 73 competitors in the Program Oral Interpretation category. Christian, a senior and a co-champion last year with graduate Colton Blanton in the Drama Interpretation category, placed sixth in the state overall in the category this year, and was invited to participate in the National Speech and Debate contest June 17-21 in Dallas, Texas. In all, 14 WHS Speech & Debate team members qualified for competitions this season that began at the district level in February. Muller said their successes weren’t simply from dutifully giving soporific presentations. The opening and closing ceremonies of the state contest were held at the Palace Theater in Canton, a renovated vaudeville house from the early 20th century. “It was neat to be in that kind of historical venue, and it upped the atmosphere of the competition,” Muller said. What casual observers may not know is that speech and debate is an endurance test, she said. The high school participants face preliminary, quarterfinal, semifinal, and final rounds during the seven-month season, and must bring their A-game to each. In September, each team member chooses a category in either speech or debate with guidance from their coach, then auditions to showcase their strengths. Speech enthusiasts select a piece from a copyrighted play, novel or memoir, then reduce the material to a 10-minute “cutting.” They can choose from 13 categories that include Dramatic Interpretation, Dual Interpretation, Humorous Interpretation, Oratory, and Extemporaneous Speaking. The season consists of analyzing the material and deciding what to emphasize. Members can also select from debate categories such as Congressional, which takes place in a political type setting; Lincoln-Douglas, which addresses various sides of an issue; Public Forum, which covers topical issues; and Policy, which offers solutions. A coin toss decides whether the debaters argue pro or con, which means being fully-versed in both. The state and national Speech and Debate associations offer monthly topics. Practice tournaments are held weekly throughout the season in the greater Toledo area. The students are critiqued by coaches and by Speech & Debate team alumni and trained parents acting as lay judges, who give assessments of their performances. The WHS team feared suffering a setback this school year when English teacher Jason Robinson stepped down as assistant coach. Their concerns were allayed by his replacement, Samantha Morr. A Speech & Debate alumnus, she went on to compete at Eastern Michigan University and won in national categories. “She’s been a big asset to the team, coming back from the college circuit and knowing what’s current and fresh,” Muller said. Noah Harman said his original piece, “Breakups and Breakdowns,” is about heartbreaks, people’s emotional sides, and their tendency to fall apart over the situation. It begins humorously to draw in listeners, then takes a serious turn. This is his first full year with the WHS team, and he admits to at first having jitters. “Then I realized it was what I loved, and I liked sharing it with people, so it became very easy after that,” he said. According to Muller, giving a speech is purportedly one of a person’s greatest fears, second only to death. “Just getting up there, exposed in front of your peers, is pretty scary,” she said. But the benefits far outweigh the fright factor, she said. Speech and debate teaches confidence and self-esteem, and can help overcome bashfulness. 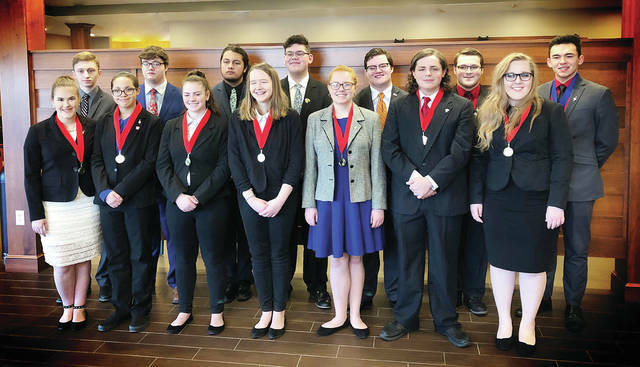 The Wauseon High School Speech and Debate team includes – front, from left – Maggie Carder, Kamron Goolsby, Olivia Gigax, Faith Stinner, Emily Hoeffel, Quintin Gigax, Anias Thompson – back, from left – Reece Mealer, Chase Mattin, Alex Guerrero, Noah Harman, Hunter Mattin, Jeb Reeves, Christian Cantu.